dB Blockers™ are superior hearing protection that is much less expensive to use than disposable earplugs or muffs. The purchase cost for disposable earplugs is usually 40¢/day (4 x 10¢/pair) $2.00/week – $100/year – at least 3 times the cost to use dB Blockers™! The cost of use for dB Blockers™ is lower because dB Blockers last for 5 years. 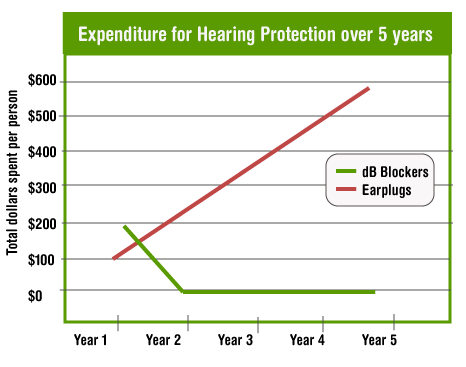 Let us show you how using dB Blockers can cut the cost of hearing protection and give your associates better protection. • Associates love to wear them because each employee is personally fit– eliminating ear pressure & pain. • Are hearing protection you can hear through, keeping the protectors in the ear. • Increase safety allowing associates to hear and localize warning sounds. • Are made with SkinSoft™ hypoallergenic, non-flammable medical grade silicone. Complete our “Get More Information” form and one of our industrial hearing protection specialists will get back to you to discuss your hearing conservation program goals. We can help recommend a dB Blocker model that will exceed your needs. Or you can simply call us at 800-520-0220, ext. 321.